Distracted driving is rampant, even though those who admit to doing it know it's a highway hazard. With smartphones as ubiquitous as they are, and the inherent dangers of distracted driving so great, just about every state in the country has laws in place meant to keep motorists’ undivided attention on the roads. Yet despite the general acknowledgment that texting and driving is irresponsible, many continue to do it, a recent poll suggests. More than 60 percent of licensed drivers multitask when in traffic, even though they recognize the danger the activity poses, according to a survey done by vehicle valuation firm Kelley Blue Book. Distracted driving can come in many forms, like eating or drinking, but it’s skyrocketed since the onset of smartphones. Americans look at their handheld devices a whopping 9 million times per day, according to estimates done by Deloitte, an advisory services firm. And texting is a common reason why. The KBB.com poll found that 67 percent of motorists who admit to using their phones while on the roads do so for texting purposes, with only GPS navigation and talking more common. It would be one thing if distracted driving didn’t have any repercussions, but government data suggests otherwise. For example, after decades of registering declines in highway fatalities, deadly car accidents increased across the country in 2015, up 7 percent from 2014, according to the National Highway Traffic Safety Administration. Officials attribute the uptick, in part, to a higher number of crashes in which multitasking played a contributing role. The distracted driving epidemic – responsible for approximately 3,200 road deaths per year, according to NHTSA – isn’t confined to any one part of the country. It’s happening everywhere. For example, in Pocatello, Idaho, 33 motorists were cited for driving while distracted only a few months into 2016, local ABC News affiliate KIFI reported. Idaho State Police Captain Eric Dayley told the news outlet that this figure is undoubtedly much higher, because the no-texting law is difficult to enforce. Indeed, between 2010 and 2014 – a period in which smartphone use wasn’t as high as it is today – 2,018 of the state’s motorists were seriously injured in distracted driving crashes, according to the Idaho Transportation Department, and 207 were deadly. In an attempt to discourage drivers from texting, talking or surfing the internet while driving, state and local governments have gotten involved. Idaho is one of 46 states where all motorists are strictly forbidden from texting, according to the Governors Highway Safety Association. The punishment is usually a fine, which varies depending on the state or municipality. Fourteen states, along with the District of Columbia, also ban drivers from talking on their phones altogether. This doesn’t include Idaho just yet, but several communities within the state are considering passing this type of legislation or have already. Blaine County is one of them, and violators can be fined up to $100, according to community newspaper The Times-News. Distracted driving laws have been in place for several years, but the practice hasn’t dipped with any great significance and in some places has risen, according to the National Safety Council. NHTSA hopes phone manufacturers can help change that by adding features to cell phones that disable them when motorists are driving. Late last year, the Department of Transportation, which oversees NHTSA, published a set of guidelines that urges developers to adopt such technologies in their designs. “These common sense guidelines, grounded in the best research available, will help designers of mobile devices build products that cut down on distraction on the road,” said Anthony Foxx, former Transportation secretary. Meanwhile, motorists have to practice self-discipline and parents are advised to monitor their teens’ cell phone use. At Distraction.gov, teens can take the pledge in which they vow to stay off their wireless devices whenever they’re driving. 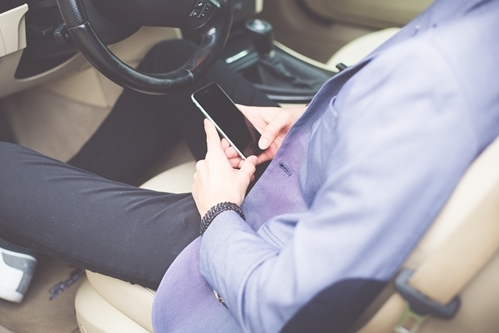 Chris Huwaldt, managing director of personal insurance at PayneWest, noted that the importance of motorists’ avoiding distractions can’t be emphasized enough. Here at PayneWest Insurance, we join the traffic safety community in urging parents to be an example by pledging to always keep their focus on the roads. If every one works together, distracted driving really can come to an end.